You can order a half or a full rack, and Artz Rib House is quite generous with their portions. 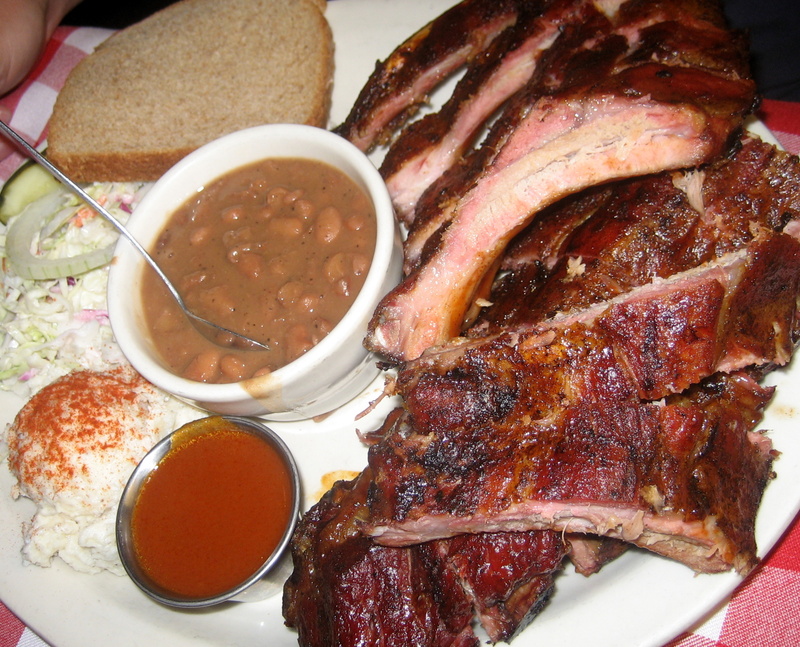 The ribs are thick, juicy, tender, and have a great smokiness to them. There was some tangy barbecue sauce on the side that complemented it well. There wasn’t even one fatty piece – how impressive! The bean soup tasted as if it were made with a lot of lard – gross. 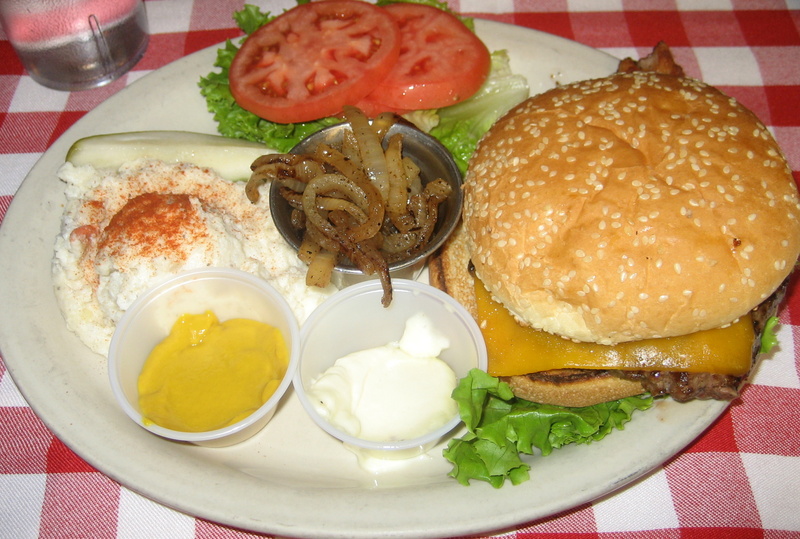 Comes with grilled onions, jalapenos, bacon, lettuce, tomatoes, mayonnaise/mustard and one side item. 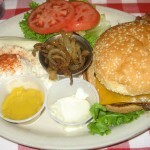 We had the burger cooked medium, without jalapenos and chose the potato salad as our side. This is one of the best burgers we’ve ever eaten. The beef was delicious and a little smoky – it just melted in our mouths! The potato salad was solid. 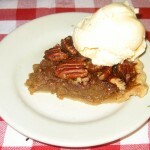 This pie is definitely sweet but the pecans are kind of chewy/stale tasting. It went well with the ice-cream though. 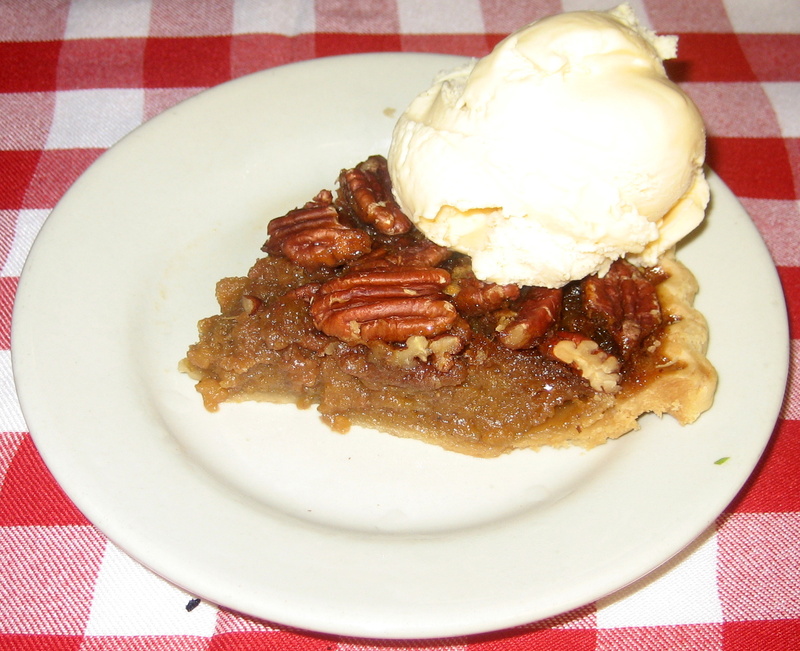 We suggest trying a different dessert. 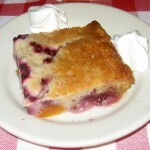 This cobbler proved strange because it resembled a square-shaped, spongy cake with bits of raspberry and peach inside. 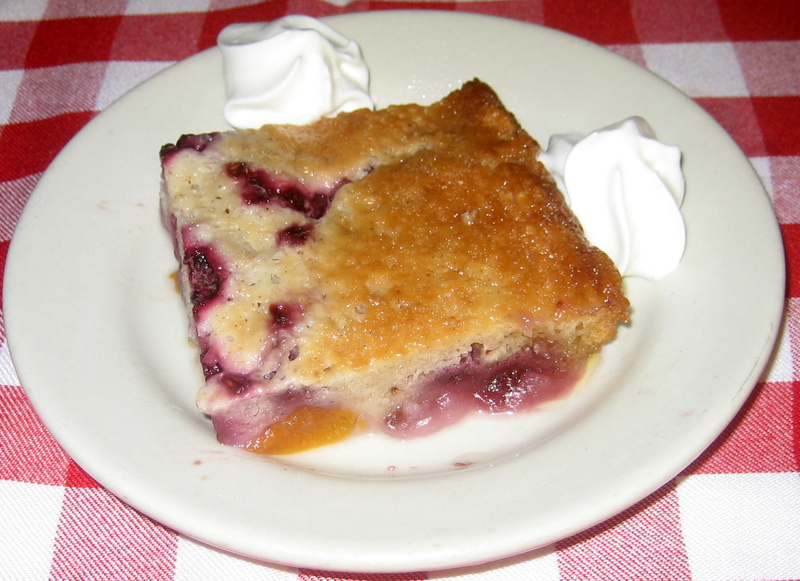 It didn’t taste as a cobbler should, yet it didn’t taste badly either. Just a simple, mediocre dessert. We were seated quickly and our waiter was pretty friendly. The first drink came out on time but the second one took much longer. The waiter did check up on us once or twice, but it took a little while to get our bill at the end of our meal. Overall, the service was fine and we only had minor issues. Artz Rib House has plenty of parking available. It looks like a large shack/barn from the outside, and has a country diner feel on the inside. There are many tables indoors and a couple outside as well. It’s woodsy, clean and casual – good for small or large groups. Sometimes a restaurant’s name is an indication of what they do best. We’d skip dessert here but the ribs and burgers are reason enough to come again! Chrissy, Kathy and I went here May 20, 2010 for dinner. We ordered a rack of baby back ribs, a veggie plate and garlic soup for an appetizer. The soup was extremely delicious. It was one of my favorites. I agree on the no fat on the baby back ribs and they tasted good, but there wasn’t a lot of meat on them. the veggie plate had grilled peppers, onions, mushrooms and jalapenos was tasted good. The second favorite food I enjoyed was the mashed potaotes! Their service was good. Even the owner came over and said hi. They had a group of ladies sing some old songs which was a little strange but entertaining. Overall a great family friendly restaurant.